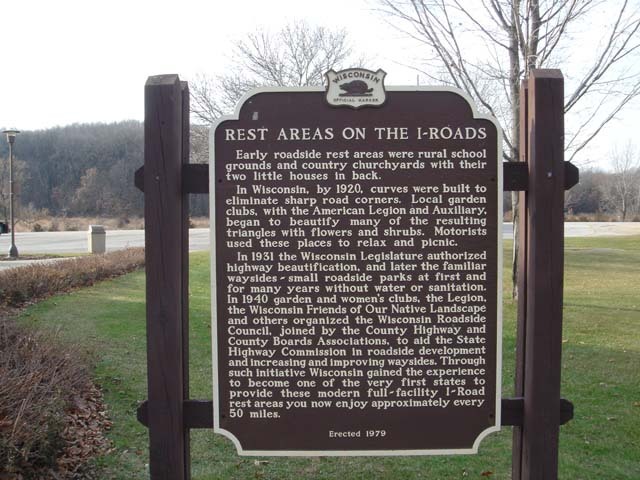 Located Southbound Interstate 90 rest area 1.3 mi south of Wisconsin river bridge Coordinates Lat N 43:25':737" Lon W 89:28':921"
Early roadside rest areas were rural school grounds and country churchyards with their two little houses in back. In Wisconsin, by 1920, curves were built to eliminate sharp road corners. Local garden clubs, with the American Legion and Auxiliary, began to beautify many of the resulting triangles with flowers and shrubs. Motorists used these places to relax and picnic. In 1931 the Wisconsin Legislature authorized highway beautification, and later the familiar waysides small roadside parks at first and for many years without water or sanitation. In 1940 garden and women's clubs, the Legion, the Wisconsin Friends of Our Native Landscape and others organized the Wisconsin Roadside Council, joined by the County Highway and County Boards Associations, to aid the State Highway Commission in roadside development and increasing and improving waysides. Through such initiative Wisconsin gained the experience to become one of the very first states to provide these modern full facility I-Road rest areas you now enjoy approximately every 50 miles.